In order to deal in shares and securities in India, you must have a dematerialized account (DEMAT) registered with the investment broker or sub-broker. All your transactions related to electronic transfer of share trades are linked to your DEMAT account. Today, every major bank in India offers a Demat account to its existing savings account holders or new ones. Most often, such a wide range of options makes it difficult to choose the right banking institute to open a Demat account. Although, every major bank in India offers best services when it comes to Demat account, I would recommend to open a Demat Account in SBI (State Bank of India) as it's the No.1 Banking Institute of India and the most reliable one without any doubt. Before understanding the benefits of opening a Demat account in SBI, you must be aware of the importance of having a Demat account and its advantages. Each transaction regarding the trading of shares is maintained under your Demat account assuring the safe custody of all your security balance in electronic form. With the help of Demat account, the account holder can convert physical share certificates into electronic balances as well as convert electronic balances to physical form (share certificate) as per his/her convenience. A Demat account helps in the management of delivery/receipt of electronic balances following any market / off-market trades. You can easily apply for Loans or advances against share via blocking securities balance of borrowers in favor of lenders using a Demat account. A Demat account also helps in faster and direct credit of security balances into DP account during Initial Public Offerings or disbursement of corporate benefits. You can also earn extra income through your dematerialized holdings via securities lending methods. Currently, SBI operates its DP activity in more than 1000 branches and is an active Depository Participant registered with both National Securities Depositories Limited (NSDL) and Central Depository Services Limited (CDSL). 24x7 Customer Care: With SBI Demat account, you will get customer care support round the clock. You can get all your queries solved either online or via call and the SBI Customer Support team will address the query and provide with an ultimate solution. Transact Anywhere: With over 1000+ Demat enabled branches of SBI, you can operate your Demat account from anywhere in India. With the online facility, you can also access your Demat account with a steady internet access. Online Facilities: SBI Demat account offers e-statements and bill through email on a monthly basis without any wastage or delay for using paper or mail service. You can access free online facility and enjoy a convenient and paper free option to handle all your transactions related to your Demat account. You can also order delivery instruction booklet online to save yourself from standing in queues at SBI branches when visit in person. Set SMS Alerts: For security purpose, SBI Demat account also enables SMS alerts on your registered mobile numbers for every debit/credit as well as any unprocessed request. 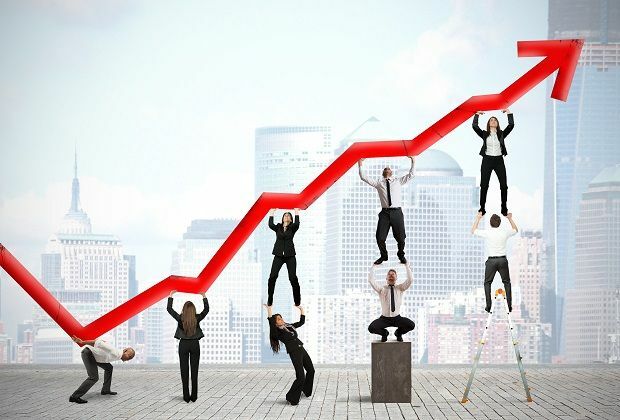 eZ Trading: With eZ trading facility, you can transfer or pledge/unpledged securities from anyplace at anytime with just a simple internet connection. Along with a Demat Account, you can also register for an Online Trading Facility with SBICap Securities Limited in order to avail the benefits of 3-in-1 account which makes an integrated universal account for your Savings Bank A/c, Demat A/c and Online Trading A/c. So, now as you are informed with all the benefits of opening a Demat Account at SBI, here are the steps to register for an SBI Demat Account online. To open a Demat Account with SBI, simply logon to SBI Cap Securities Ltd. website https://www.sbismart.com/open-account and fill up the form online necessitating whether you need only Demat Account or both Demat A/c and an Online Trading A/c. You have to enter full name, email address, mobile number, Pin code, city and need to select the product of your choice. The form is simple and easy. Click the Submit button Once you fill up the form online, a bank representative will approach you and guide you with next process and also inform you about all the necessary documents required for a Demat Account at SBI. If you don't want to submit any application form online, just call or give missed call to the number 09266792667, the bank representative will guide you step by step. 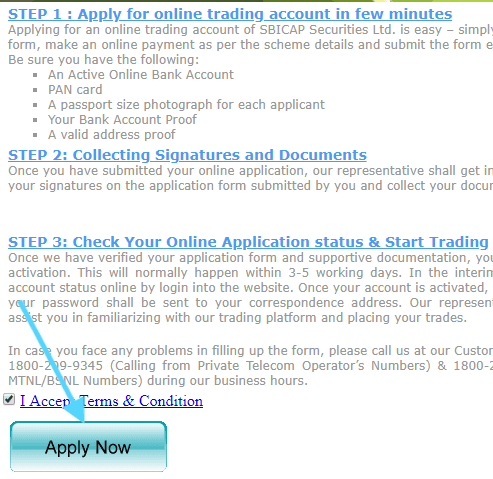 If you have good knowledge of Internet, then you can apply for online sbi trading account in a few minutes. Step 1: Open your web browser and open link https://app.sbismart.com/OnlineKYC/welcome.aspx. Now accept the terms & conditions and click on apply now button. Step 2: In next you have to enter username, password, email id and mobile number. 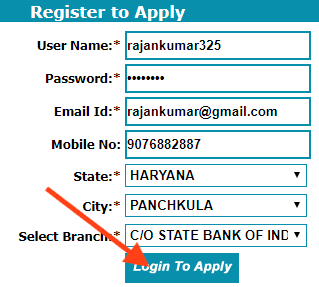 Next select your state, city, bank branch and click the login to Apply. Registration link will be sent to your registered email id. Next you have upload necessary documents to complete the registration process. Important Note: If you're an existing savings account holder at SBI, you can directly opt for a Demat account and request the bank representative to link the existing Saving Account with the new Demat Account. Documentation process won't be necessary for people with existing Savings Account holders at SBI. how much cost for the open demat account? Don't open a Demat account in the sbi..worst bank to open the demat account in India. I am an existing SBI account holder and I want to open a Demat account with sbi help..
Sir, i wanna make demat account and i am far away from my branch how can i register online. I am sk rabiul islam. I want to demat account. Please help me. Sir I have account in SBi, I also want to open demat account in Sbi. Is it possible? I want to know how i create a demat account,sir plzz help me...to create my account.